PHOTO: Allen Ramsey, DWCPhoto.com. Highlands senior Brianna Adler (10) makes a move against Ryle in the 9th Region semifinals in March. Adler will continue her career at Union College located in Barbourville (Kentucky). Adler finished her career with 1,558 points good for sixth in school history and 354 career steals good for fourth in Highlands history. Once she stepped onto the court as a seventh-grader, those associated with the Blue and White knew Brianna Adler would be the next in line of a nice list of greats in program history. Adler etched her place in Highlands Ladybirds basketball history with 1,558 career points and 354 career steals. Those marks finished sixth in scoring and fourth in steals in school history. Adler averaged 11.6 points per game this past season as Highlands finished 22-11 overall, won its third 36th District championship in three years before losing 54-51 to Ryle in the 9th Region quarterfinals. "I looked up to the older players," Adler said. "Leah (Schaefer, a 2013 Highlands graduate) still plays at Xavier. Even though I'm not going (NCAA) Division I, it's still neat to see her and how she plays and still take advice from her. I hope the younger girls still come to me for basketball advice even though I'm not (at Highlands)." That time she put into basketball paid off when Adler signed her letter of intent to play college basketball for the Union College Bulldogs located in Barbourville, Kentucky between Lexington and Knoxville, Tennessee on Wednesday. Union is a National Association of Intercollegiate Athletics school with an enrollment of 1,089 students. 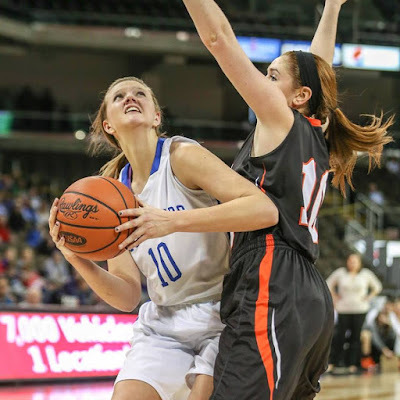 "Union College is getting a three-point specialist and an outstanding defensive player," said Jaime Richey, Highlands High School head girls basketball coach. "I’m very excited to see that Brianna’s hard work is paying off, and she will be able to continue her basketball career." Adler will join a program that has gone 288-188 since veteran Head Coach Tim Curry took over the program in 2001. The Bulldogs have had just three losing seasons during that time. Union finished 15-14 last year and 10-10 in Appalachian Athletic Conference play. Union has five AAC Tournament championships and five NAIA Division II Tournament appearances with the last ones coming in 2014. Union runs a Four-Out offense with the intent of isolating players one-on-one. Curry said Adler will step in well for the recently graduated Haley Perkins. Union hopes to get Adler shots by either guards penetrating and kicking out or passing into posts, drawing double-teams and kicking the ball out for wide-open shots. Adler said she hopes to attack the basket better to create more shot opportunities for herself and her teammates. "(Perkins) has been one of the best shooters in the (AAC) in the four years she was there," Curry said. "(Perkins) literally played the two (shooting guard), three (small forward) and four (power forward) for us. We think she'll be able to step into that role with her size, length and ability to shoot. I think the college game will help her more in that respect (of attacking the basket). You have a shot clock so the game gets quicker at times than in high school and you see people focusing on shooters and not standing in the middle clogging up the lanes so you'll have more opportunities at times." Defensively, Union likes to press all over the court and play up-tempo like Highlands likes to do. Union plays a lot of man-to-man defense in the half-court. Adler helped Highlands to a record of 101-31 in her four years of high school. Highlands did not win that elusive first 9th Region championships since 2001. But the Ladybirds did win four straight region quarterfinal games and finished region runner-up to eventual state runner-up Notre Dame in 2013. Highlands had won just three region tournament games the previous 10 years dating back to its last appearance in the region championship since 2002. "I know they had success in the past," Adler said. "But now that we've had winning seasons, they current girls will be more prepared." Adler followed in the footsteps of her older sisters Alex Adler-Begley (Highlands Class of 2008) and Mallory Adler (2009). The two helped Highlands to district championships in 2007 and 2008. Mallory Adler also helped the Highlands Ladybird soccer team to a state runner-up finish in 2008 before playing college soccer one year at Gardner-Webb University in Boiling Springs, North Carolina. "I watched them experience everything so I wanted to follow through," Adler said. "I watched them play all their high school games so I thought it would be cool if I did." Adler will major in Exercise Science and Nutrition at Union College. Curry said he plans to connect Adler with Union football Head Coach Zak Willis' wife Sara. Sara Willis is a professional trainer. "She's going to fit into Union well all-around with what she's going into academically," Curry said. "She can do internships with (Sara Willis) in personal training, fitness and that kind of stuff. That will benefit (Adler) well beyond anything she does with basketball down the road in her career." Players from Northern Kentucky have gone to Union in recent years. Former Boone County post Lydia Nash just completed her fourth season there. Nash averaged 17 points and 7.6 rebounds per game last season.